LISBON FALLS — A piece of Midcoast Maine’s deep shipping tradition is up for grabs – hundreds of pages of historical records left behind by Bath’s Crooker shipping family. The collection of letters and records document the company’s shipping interests all over the globe, from San Francisco to Europe. “It took me about six to seven hours just to sort it all out, unfold them, bring them out,” said Daniel Buck Soules, leafing through piles of records splayed over a table at his Lisbon Falls auction house. Decades worth of ship manifests, bills of sale, business letters and other records reflecting one of Maine’s traditional industries. Soules touts the documents as the largest collection of Bath shipping-related items to ever come on the market. 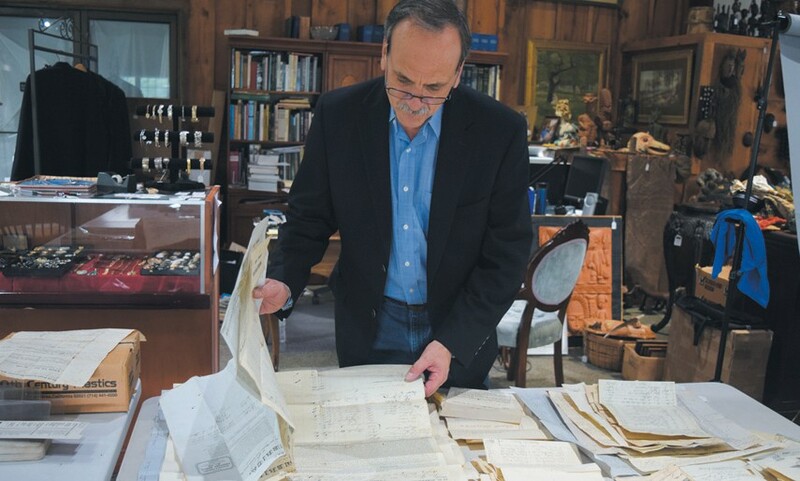 Soules, president of Daniel Buck Auctions, Inc., is working to find a new home for the collection of documents left behind by the Crooker shipping empire. Soules is dealing with the collection on consignment, after the documents were discovered by family members in a recently deceased person’s home. “This is why this is such an amazing story – there’s so much here,” he said, pointing to a document from the London Ballast Office from 1847 showing what ballast was on the ships, and a stock certificate for the Merrymeeting Bridge. “I don’t know if there’s ever been this quantity of Bath shipping history that’s come onto the market in one big clump, so to speak, and all from the Crooker family,” he said. While many know the Crooker family name from Crooker Construction, the documents relate to the family’s earlier successes in shipping in the 19th century. Crooker brothers Charles and William launched a small shipping company in Bath in the early 1800s, which would reach its zenith in the middle of the century. Bath is a relatively quiet city these days, with the exception of commuters dashing in and out of town around Bath Iron Works shift changes, but the Crooker documents speak to a different time, when Bath was a vibrant trading hub. “What you have to realize is other than Boston and New York, Bath was the third largest shipping port in the country in the late 18th, early 19th centuries,” Soules said. He estimates the value of the collection from $6,000 to $12,000, and says he would like to find a new owner for the documents who would keep them together.